I know it seems weird after all of this Christmas posting... and with Christmas a mere 12 days away...eek! But we are switching gears to Valentine's Day! At least for today. Beginning today Close To My Heart has a FUN National Papercrafting Month (in January) special but they always start it early in mid-December. This year's project kit is a FUN Valentine treat kit. This "Whoo's Your Valentine" kit contains some new treat tubes and silver glitter paper that will both be in our new Spring/Summer catalog coming out February 1st but you can get them early with this kit. It also includes 12 die-cut boxes, 3 sheets of cardstock to stamp on, an exclusive stamp set (that is sooo cute!). It also comes with a picture of how they chose to assemble everything. Many of their tube toppers were made with the cricut Artiste cartridge but you can easily create some cute designs on your own if you don't have that cartridge. Here are the details: Spend $35 on product (before shipping and tax) and add this exclusive kit for only $10! Yep- everything for only $10. 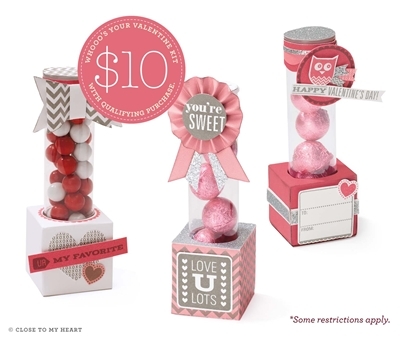 The kit creates 12 great gifts so you are talking under $1 each (before the cost of treats) AND you have a stamp set to keep that is valued at $17.95!!! So essentially- the part of the kit you are giving away... is FREE! Limit of one per qualifying order.